TRUMBULL -- The morning rain ebbed as a procession of vehicles arrived for Friday's memorial Mass for Mary J. Sherlach, the school psychologist killed during the Newtown massacre a week earlier. Minutes later, the clouds gave way fully to sunshine as Sherlach, 56, was remembered as a spunky Miami Dolphins fan who loved her job and spent her life in service of others. Mourners stepped from parked cars and into the embrace of one another. 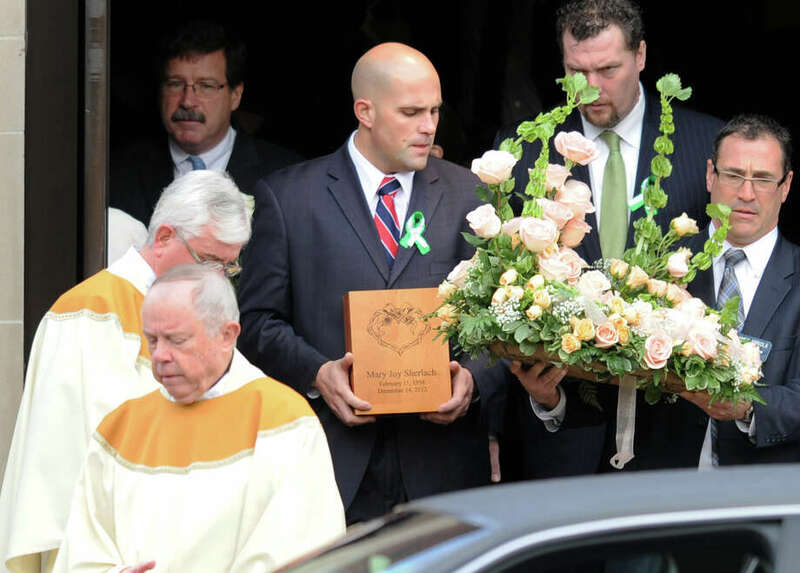 The first to enter the open double doors at St. Stephen Roman Catholic Church were three men in uniforms, two carrying bouquets of white roses and the third an urn containing the victim's remains. Sherlach was killed at Sandy Hook Elementary School when she ran toward the shooter in an attempt to stop him. But observers inside the church said Friday's service was focused on the way Sherlach lived her life and not on the way it ended. Two of her friends recalled a compassionate woman who gave her time to anyone who asked for it. Another eulogized her with funny stories and took off his jacket to don a teal Miami Dolphins football jersey. He said Sherlach was a fan of the team's famed former quarterback Dan Marino, and she and her husband, Bill, would go to games often. Should the crowd's enthusiasm wane, he told mourners, Sherlach would always rally them. The NFL team sent a teal and orange floral arrangement, which was placed on the altar near a Dolphins jersey left by someone else. To the left of the altar, another stand paid tribute to another of Sherlach's passions with a gray Sandy Hook Elementary School T-shirt. Sherlach may have loved Dan Marino, but she lived for her job. One eulogist said she was often busy with school activities, so it was a source of consolation for her husband that they had spent a little more time together than usual last Friday morning. Sherlach had plans to retire next year. "It was a beautiful service," said former U.S. Rep. Christopher Shays. "You felt that God was in that room." Gov. Dannel P. Malloy and Trumbull First Selectman Tim Herbst were also in attendance. Shays didn't know Sherlach, but his wife, Betsy, said the couple wanted to pay their respects to the shooting victims. "We just came out of quiet love and respect," she said. "I would like to think great good is going to come out these unimaginable events."